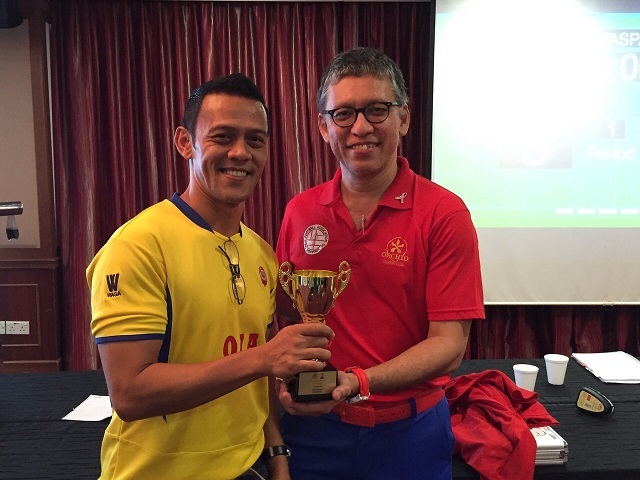 26th October 2014 was the date where the very 1st Orchid WASPA Challenge took place at the Ruby Suite of Singapore Orchid Country Club. A total of 14 players took part in this competition which saw a unique format being used. 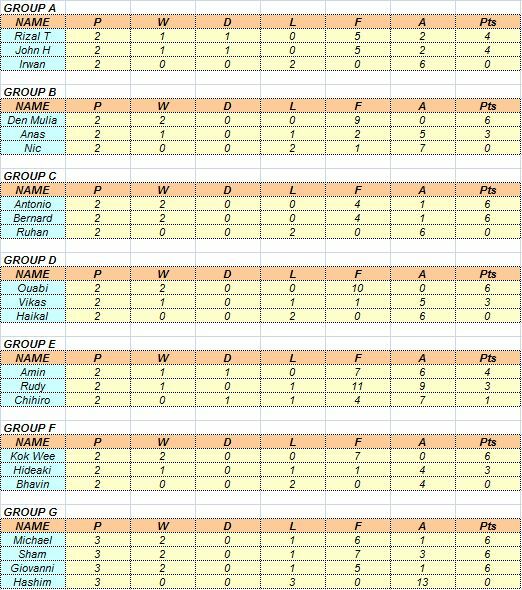 2 groups of 7 players vie for the top 4 spots in each group with 4 rounds of SWISS Format fixtures. In the end of the group games, Den Mulia, Michael, Rudy, John, Anas, Bernard, Kok Wee and Vikas made it into the Quarter Finals. After another round of knock-out games in the Quarters, it was Den Mulia, Bernard, Kok Wee and John that prevailed and moved into the Semi-Finals. 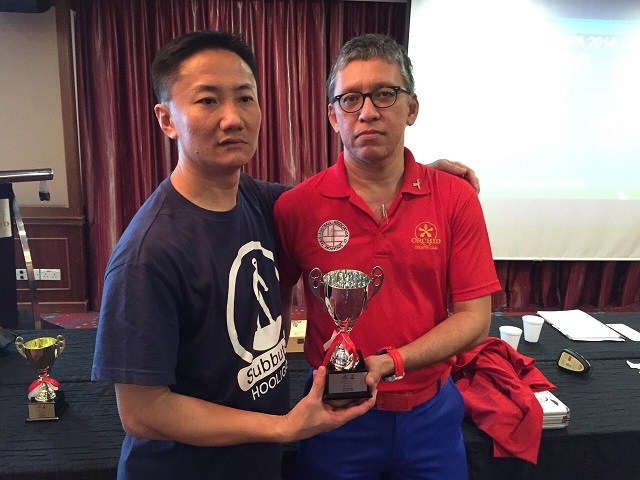 With 2 games decided by a solitary goal each, Kok Wee and Den Mulia played out an exciting Final, where Kok Wee succumbed to the pressure and surrendered the Title of the Orchid WASPA Champion to… DEN MULIA!! This competition also saw the the very 1st Team event organised. 3 groups of 4 players each played in a triangular format before the top 2 played out the final. 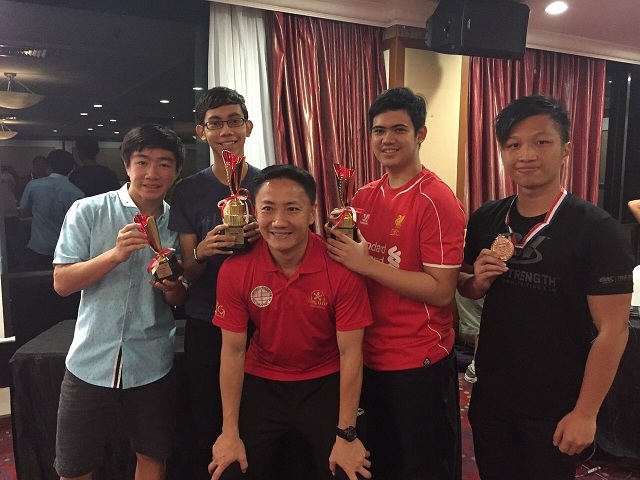 Team Bravo comprising of Antonio, Rizal, Anas and Captain Den Mulia, managed to edge out their opponents by a solitary point to take the Team challenge. 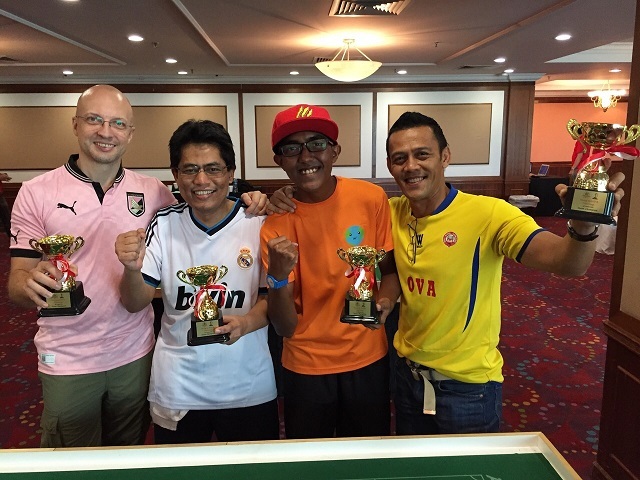 As a whole, it was yet again a memorable, exciting and super fun competition of SPORTS TABLE FOOTBALL! 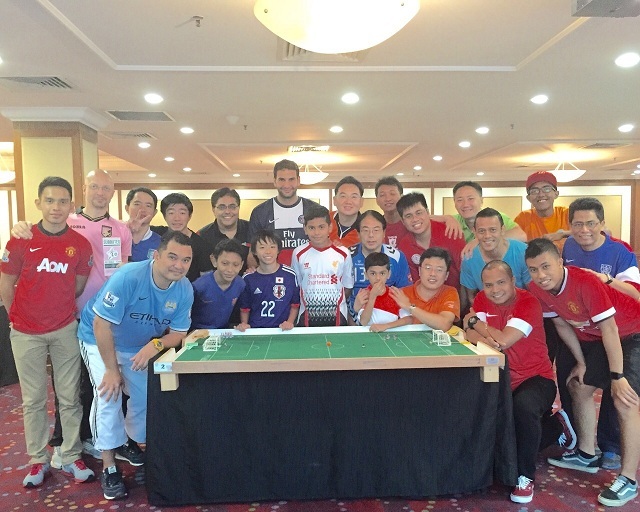 A good turnout of 22 players gathered at the Orchid Country Club, Ruby Suite, to battle it out for honours in the final tournament event on the SG Table Football calendar – the TFAS-OCC Merlion Cup 2014 Open Tournament (a FISTF Satellite tournament). The players were drawn into 6 groups of 3 players + 1 group of 4 players in accordance to FISTF regulations based the latest available FISTF World Rankings. 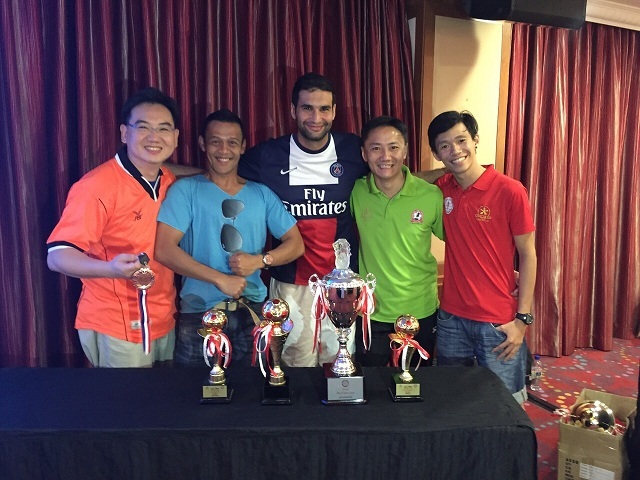 Odds-on hot favourite was none other than the defending Merlion Cup Champion – Ouabi Rouis!! After an eventful day, as expected, Ouabi Rouis successfully defended his Merlion Cup title to add-on to the TFAS Cup and SGTF Premeir League titles he had already won in 2014. What a successful year for him!! The Runner-Up was none other than our SG National Champion, Den Mulia who lost out narrowly by a solitary goal; while 3rd place went to our President Kok Wee after a hard-fought victory against Bernard in a dramatic playoff – where he led comfortably by 2 goals at half-time only for Bernard to come back with 2 goals to tie the game in the 2nd half. A Plate knock-out tournament was also organised for players who did not make it out of the Group stage. Newcomer Irwan Iskandar (in his very 1st tournament) did well to qualify for the semi-finals where he took on Nic – who took the place of Giovanni who had to leave early. What a twist of fate for Nic as he went all the way – taking Haikal to shots to win by 3-2 and emerged as the Plate Champion!! Congrats Nic!! Thank you all players for your participation and sporting behaviour throughout the course of the tournament. And congratulations to all Winners!! 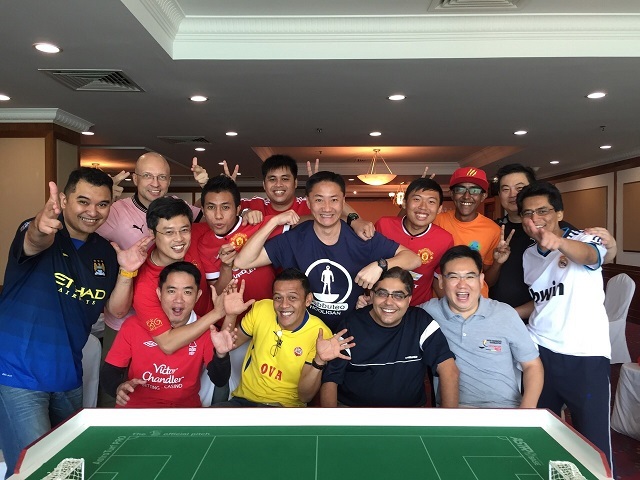 … as the table football calendar draws to a close in 2014, we look forward to 2015 with the commencement of the 3rd season of the SGTF League and also take this opportunity to wish everyone in the Table Football Community an advanced Merry Xmas and Happy New Year!! 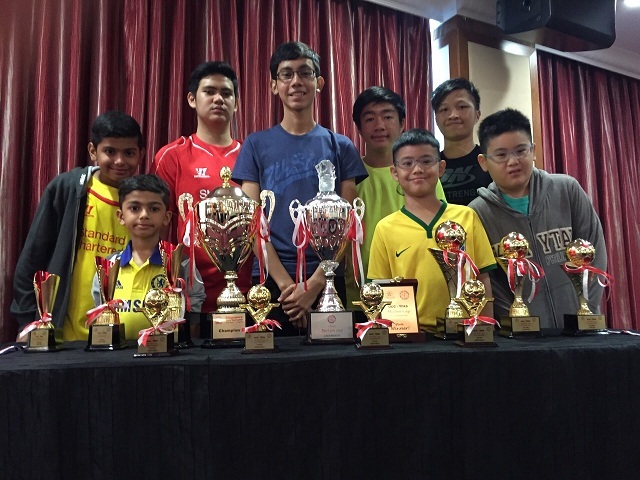 FOR THE LOVE OF THE GAME ..
A total of 8 U19 players contested the final tournament of calendar 2014 – the TFAS-OCC Merlion Cup (U19) event at the Orchid Country Club. The Swiss system was once again adopted for this FISTF Satellite tournament. After 4 rounds of action of the Swiss system, the final standings saw Fadhly finishing top of the table with an unbeatean record of 3 wins and a 1 draw yielding 10 points. 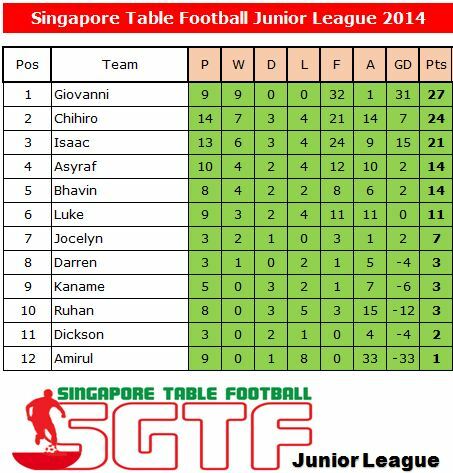 Azhar was tied with Giovanni on 7 points but finished 2nd by virtue of a better goal difference. Galvin edged out Isaac by a single point to take the 4th and last spot for the final round of play. Tellingly, age and experience made the difference for the 4 older boys as none of the U12 boys made the cut to the top 4. The final round of play saw Giovanni and Galvin playing-off for 3rd / 4th placing while perennial rivals Fadhly and Azhar fighting to be the 2014 Merlion Cup U19 Champion!! Giovanni comfortably defeated Galvin 3-1 to take 3rd place. However, the final is a much closer-fought contest as Fadhly and Azhar played out a 0-0 draw at full-time. It took extra-time for Azhar to show the difference as he edged out Fadhly by a solitary goal!! This was Azhar’s 2nd U19 title of the year as he added the Merlion Cup crown to the TFAS Cup crown he won earlier in the year!! Congratulations Azhar!! .. and well done to all players!! 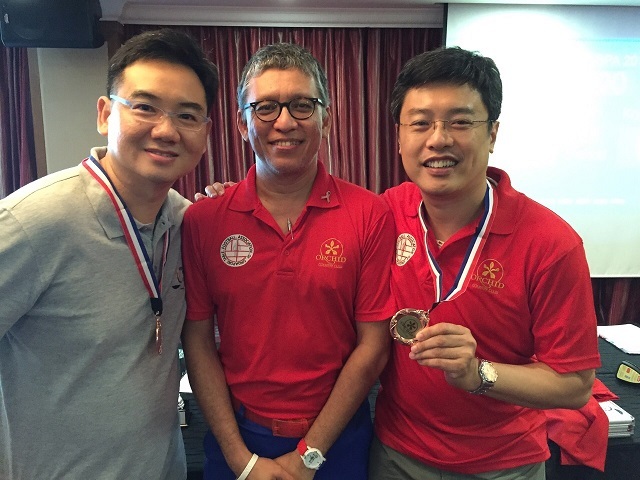 For the 1st time, a WASPA-style Open Team Event was also organised and a total of 20 players participated. The 5 teams were then engaged in a round-robin format with each team playing a total of 4 games against one another. 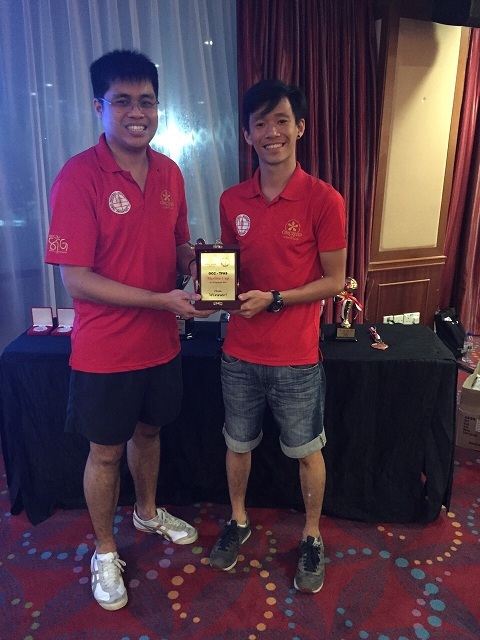 The team that finishes top of the group is declared the Team Event Champion. 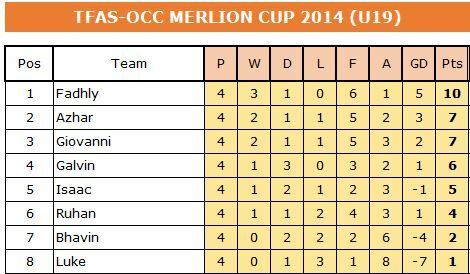 At the end of the day, Team Bravo emerged top and became the very 1st Merlion Cup Open Team Champion!! .. Congrats to Team Bravo!! 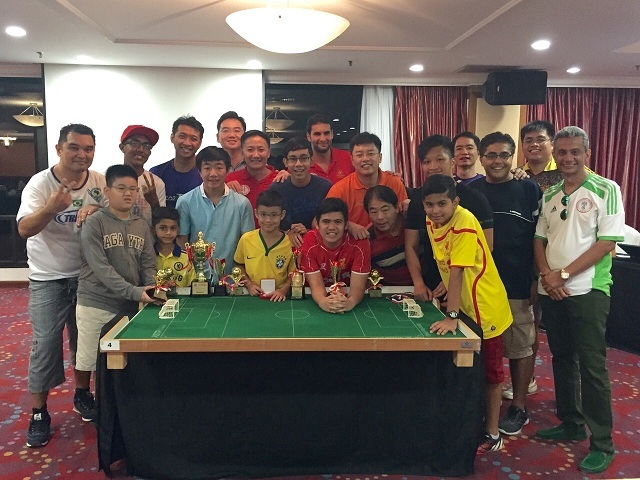 The 9th matchday of the SG Table Football Premier League and Junior League took place at the Sports Hub Library. A total of 22 games were played i.e. 21 games in the Premier League and 1 game in the Junior League. Many of the top players consolidated their position and both Vikas and Bernard completed their 2014 League Season after having completed 30 games. There was another unfortunate withdrawal – John Edwards. 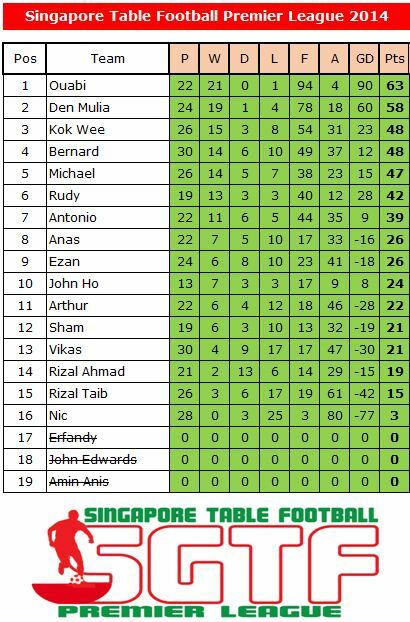 Similar to the previous withdrawals, the Board of the SG Table Football Premier League has ruled that the results and scores of the games involving John Edwards shall be declared null and void. We hope that John Edwards can continue flicking and join us for TFAS tournaments and for friendly games whenever available. 1 Junior League game was played between Asyraf and Isaac, with Isaac winning 4-1. This result did not alter the League positions. Have not heard about the game before? Don’t worry! 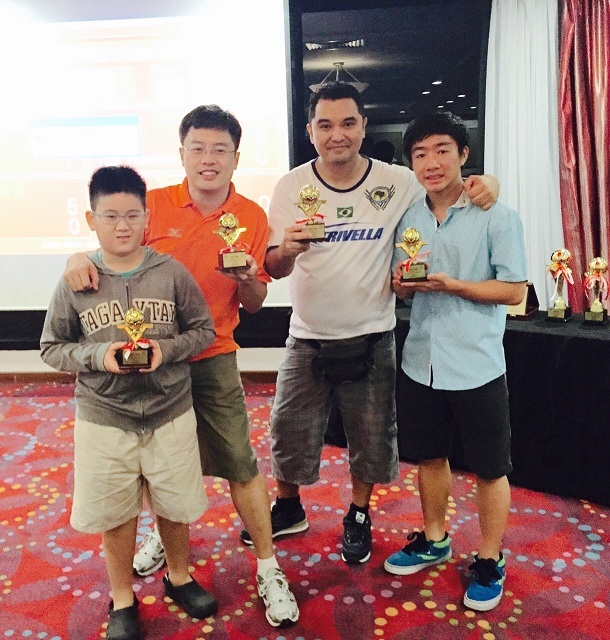 We now have 3 registered clubs here in Singapore to help you learn the basic of table football at no charge! No age restriction. You just need a working index finger to flick! With practice and guidance from players in the club that you are attached to, you never know you could be one day selected for the Singapore National Team! So what are you waiting for? Contact us today! If you are interested to see some of our seasoned players in action. You can also catch them playing competitively during the National League Days. The National League Days happens with the below schedule..
** IMPORTANT NOTE: If you are dropping by, do also email us at tfasingapore@gmail.com so that you will get updated in case of a last minute changes to our league match day schedule or venue. Alternatively, you can also fill up the form below if you have any enquiries and our team will get back to you as soon as possible!